Andrew Carnegie is my favorite robber baron. Here are some reasons why. 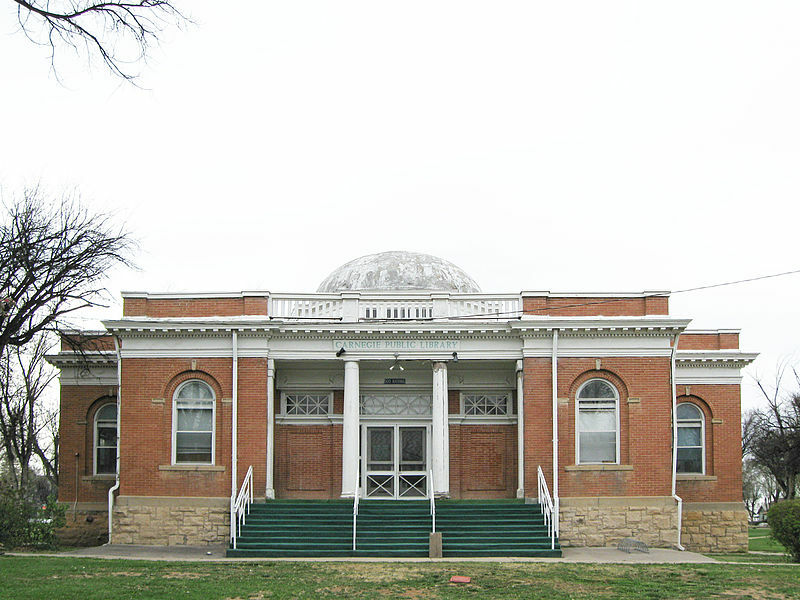 A Carnegie library is a library built with money donated by Scottish-American businessman and philanthropist Andrew Carnegie. Two thousand five hundred nine Carnegie libraries were built between 1883 and 1929, including some belonging to public and university library systems. One thousand six hundred eighty-nine were built in the United States, six hundred sixty in Britain and Ireland, a hundred twenty-five in Canada, and others in Australia, New Zealand, Serbia, the Caribbean, and Fiji. Few towns that requested a grant and agreed to his terms were refused. When the last grant was made in 1919, there were 3,500 libraries in the United States, nearly half of them built with construction grants paid by Carnegie. I look for Carnegie libraries wherever I travel. Love this! My hometown library was a Carnegie library. I can still smell the combination of mustiness, dust, and new carpet in the basement children’s room. Most that I see now are being used for something else but there is no mistaking them. Cargnegie is actually a distant cousin of mine and while I won’t comment on his business practices, his legacy of libraries is without peer. The small Northern Manitoba town I grew in was one of the grateful recipients of a Carnegie Library. Our academic standing in the area always surpassed that of the surrounding schools in towns, who, unfortunately, did not have libraries. I am sure that very few of the users, (myself included) were aware of, or cared where Mr.Carnegie got the money from. He left one of the greatest legacies to circumvent poverty that North America has ever known. There were seven Carnegie Libraries in my hometown of St. Louis when I was growing up, eight in my mid-life adopted hometown of San Francisco including the marvelous but no-longer Main (now the Asian Art Museum), and one here in my new-life hometown of Santa Rosa. Safe to say I’ve been in and out of Mr. Carnegie’s wonderful gifts my entire reading life. I’m so jealous of all three of you. I just realized that my previous comment sounded rather rude re the money issue. That was not my intention at all. I love our library. My husband and I volunteer as storytellers for the library system every so often. And now, there is even a juice and coffee bar with real cappucino – wonders never cease. Being the subservient, obedient wife that I am, I of course support this idea wholeheartedly. 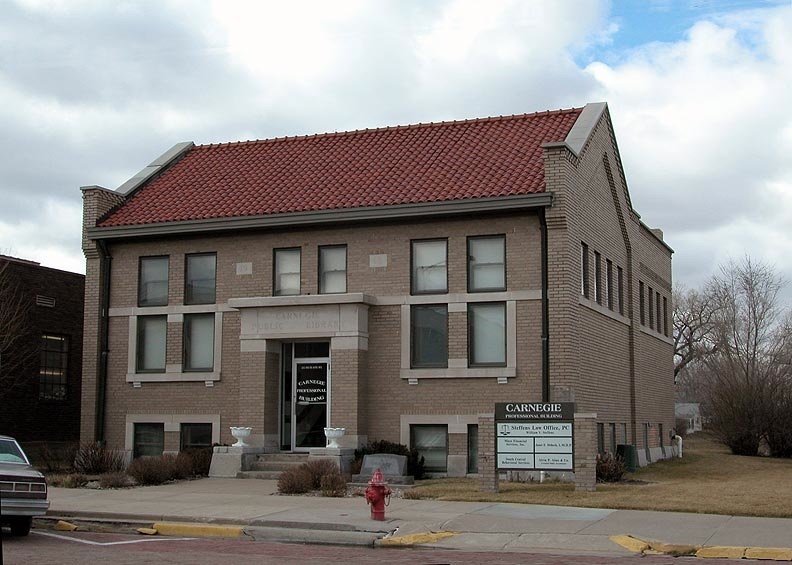 Our Carnegie library in Idaho Falls, Idaho, was outgrown as the population expanded. So, the City donated it to the county historical society for a museum. Then they received a large donation to help expand the museum. Today, the library is a part of the Museum of Idaho, which is able to attract world class exhibits like “Titanic,” “Bodies” and a “T.rex Named Sue.” Carnegie’s legacy lives on in a way he might never have imagined. Lovely stories, guys. And I’m still pea green with envy. We have a Carnegie Library in my hometown of Covington, KY. I remember going there often. It’s no longer a library but is still standing and used for meetings, reunions and as a theatre, beautiful building. It was replaced as the Kenton County Library many years ago and we now have three libraries in our county. The one that replaced Carnegie is currently being remodeled and expanded. St. Lawrence County in northern New York State has its own version of Carnegie libraries – A. Barton Hepburn libraries. Mr. Hepburn was born in St. Lawrence County in 1846 and had a long career in banking, including a stint as Comptroller of the Currency under Benjamin Harrison. All the Hepburn Libraries look pretty much alike and as far as I know are all still being used as libraries. A free society depends on unfettered access to information, and public libraries are essential to support that. Andrew Carnegie did more than any individual of his time to guarantee that citizens across the country could inform and enrich themselves. Thanks for the beautiful picture of the Green Lake Library, where I once had the privilege of working. As a patron and as a librarian, I’ve enjoyed Carnegie libraries across the country, in cities and small towns. They have a sense of place that few modern buildings possess. After some of his early libraries were built as architectural conceits, Carnegie imposed strict guidelines on future libraries that guaranteed that they functioned well. That explains why Carnegie libraries are so easily recognized. I was pleased to discover, when we needed to rewire and upgrade libraries to accomodate the computer age, that our Carnegie branch libraries were also very adaptable to change. 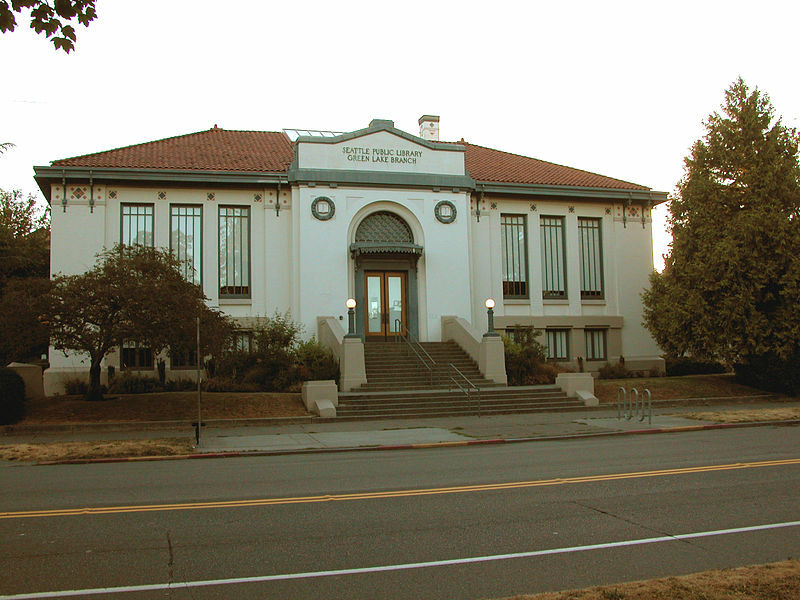 The Fremont Library, another Seattle branch, was one of the last Carnegie libraries built, in 1919. My father-in-law, age 96, remembers attending the grand opening. It is still a vibrant, beautiful library. I remember stumbling over one in Las Vegas, New Mexico. They are everywhere, and always a wonderful discovery.